A Reading of 180 DEGREE RULE with Pride Films and Plays Women's Work at the Hoover-Leppen Theatre of Center on Halsted, 3656 N. Halsted, Chicago, IL. 180 DEGREE RULE with Saturday Reading Series at Chicago Dramatists. 180 Degree Rule explores the conflicting realities that emerge as history is distorted by passage of time and shifting points of view. 180 Degree Rule was inspired in part by the pioneering female directors of early Hollywood, such as Dorothy Arzner, Alice Guy-Blaché, and Lois Weber. The show’s most extensive historical nod is to Arzner, an open lesbian who was notorious for affairs with her leading women, including Joan Crawford. She worked throughout the 1920s-40s, creating films with independent, complex female protagonists – often with lesbian subtext. 180 Degree Rule is a 2013 graduate of BWBTC’s Fighting Words script development program. It was also a finalist in the 2013 Pride Series Women’s Work Competition (for works by women with lesbian characters or themes), and was hosted for a final 2013 public reading by Chicago Dramatists. M.E.H. Lewis’ work has been produced in New York, Los Angeles, Chicago, Detroit, and Melbourne. Her honors include a Julie Harris Award, a Joseph Jefferson Award for Best New Work, two Illinois Arts Council Fellowships, three Ragdale Foundation Residencies, a Tremain Grant, and the FutureFest Outstanding Playwright Award. Her Jeff-nominated play Burying the Bones was recently revived at Detroit Rep, where it garnered universal critical acclaim, sold-out audiences, and a Best Production award. Barbara Lhota is an award-winning playwright and screenwriter with over 200 plays published and more than 60 productions to her credit. She is a member of the Dramatists Guild and a network playwright with Chicago Dramatists and Chicago Pride Films and Plays. 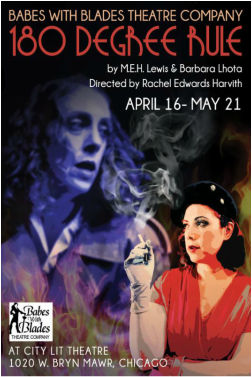 Also a member of Babes With Blades Theatre Company’s ensemble, Barb has premiered two other scripts with the Babes: Los Desaparecidos (The Vanished) in 2008, and The Double in 2011. Her work is published with Chicago Dramaworks, Smith & Kraus, Pioneer Press, and Meriwether Publishing.